These themes are woven into the fabric of the ancient text of transcendental knowledge known as the Bhagavad-Gita, translated into English as the Bhagavad-Gita As It Is, with commentary (purports), by His Divine Grace A. C. Bhaktivedanta Swami Prabhupada. In his introduction and purports, Srila Prabhupada identifies these themes. 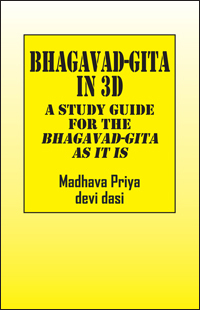 This book, Bhagavad-Gita in 3D, takes the words of Srila Prabhupada seriously as a study guide for the Bhagavad-gita As It Is. It pinpoints exactly where Prabhupada identifies the themes and then goes on to show exactly where Krishna explains the same themes. If one studies the Gita according to these themes, the stunning beauty of this transcendental knowledge well jump out in 3D clarity, and such study will become an exciting life journey. Madhava Priya devi dasi has been studying and practicing the principles of the Bhagavad-Gita for over 20 years, as a second-generation or grand-disciple of Srila Prabhupada. To order a copy of the Bhagavad-Gita As It Is, or other books by Srila Prabhupada, please go to www.krishna.com.